Several small NC cities just made WalletHub’s list of the nation’s best small cities to start a business. Wilson takes the highest spot in the state at number six! The list ranked 1,261 small cities, making Wilson’s 6th place spot even more impressive. WalletHub rankings were determined by 16 key metrics including access to resources, business costs, average revenue, average growth in the number of small businesses, and length of work week. In addition to ranking highly overall, Wilson ranked well for Business Costs, which includes Office-Space Affordability, Labor Costs, Corporate Taxes, and Cost of Living. If you’re thinking about starting a small business in the Triangle area, you should definitely take a closer look at Wilson, NC. One big plus to living and working in Wilson is its proximity to Raleigh and the ease of travel, thanks to its location at the interchange of I-95 and Hwy 264. The highways make getting around the Wilson area a breeze. Since its off a major interstate, Wilson has great options for shopping and restaurants, Plus, there are lakes and parks to enjoy everything from hiking to fishing. If being one of America’s “Best Small Cities to Start A Business” and its convenient location make Wilson sound like your ideal place to call home, learn more about Wilson and check out Wilson NC homes for sale. Contact us, your Five County Specialists, at 919-887-5114 to learn more about moving to Wilson. 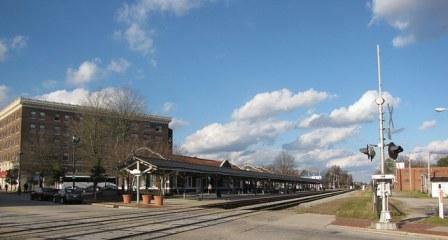 We know the area well and love telling people all about Wilson, NC!